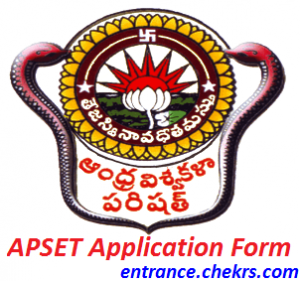 APSET Application Form (एपीएसईटी आवेदन फॉर्म) 2017: The Andhra University has recently broadcasted the APSET 2017-18 Notification on 19th March 2017 and in this notification is has included complete details about AP State Eligibility Test 2017. Only the candidates who have completed their Master’s degree with minimum 55% marks will be considered eligible to register themselves by submitting the AP SET 2017 Online Application Form. Online registration for APSET 2017 has been started from 30th March 2017. Before start applying for the APSET, candidates should make it sure that they are qualifying the eligibility criteria in all the aspects. There are no upper age limits for the applicants and hence they are suggested to apply for AP State Eligibility Test Application Form 2017 on or before the last date, i.e. 10th May 2017. After the last date, candidates can apply until 17th May, 24th May, and 10th June 2017 after paying a late fee of Rs. 1000, Rs. 2000 and Rs. 5000 respectively. It is must necessary for all the applicants to satisfy the eligibility norms in all the aspects before start registering for the APSET 2017 Online Form. The online submission of applications for Andhra Pradesh SET 2017 has been started from 30th March at its official website. AP SET (State Eligibility Test) Application Form 2017 will be accepted only until the last date, i.e. 10th May 2017. After that, the candidates interested in applying for APSET have to pay the late fee in addition to the normal application charges. Visit the Andhra University website, i.e. andhrauniversity.edu.in. Seach for APSET 2017 link and click on it. Or you can directly visit the official website of APSET, i.e. apset.net.in/. Click on the “Notification” link given in the menu bar and read the complete eligibility norms. The application form will be displayed on your system screen. Fill all the entries that are shown in the online form. Attach the scanned copies of all the necessary documents and other attachments. Pay the required application fee, for that Click on the “Proceed to Make Payment” link. Then the candidates will be redirected to the SBI website. Note down the transaction ID and the payment will be updated within 24 to 48 hours of online payment. You can download your application form after the updations in payment status. Academic Qualification: Candidates must possess Master’s degree/ Equivalent with Min. 55% marks (without rounding off). Age Criteria: There are no upper age limitations for the candidates. 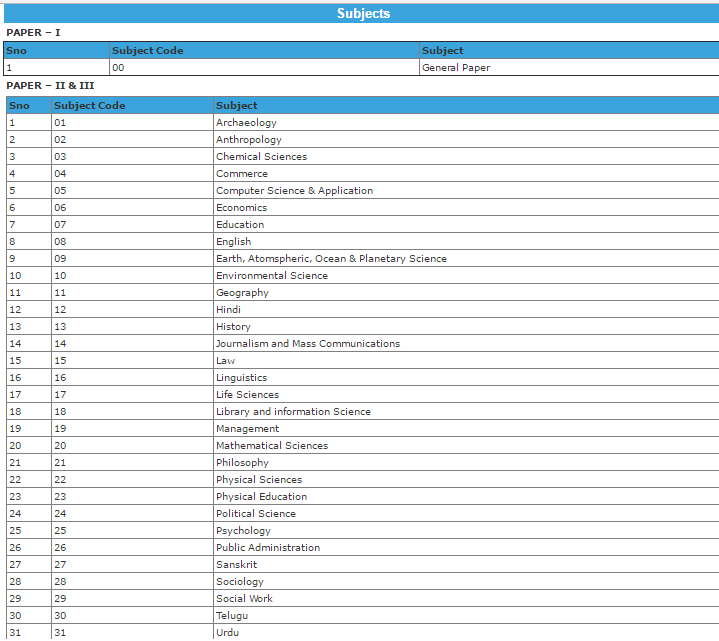 All the 03 papers will be conducted on the same day in 03 different sessions. Paper Language: Bilingual (English & Telugu). Paper-II: Common for all the appearing candidates. Paper-II & Paper-II: (A) Commerce (B) Education (C) Economics (D) History (E) Public administration (F) political Science (G) Sociology (H) Social work. Total No. 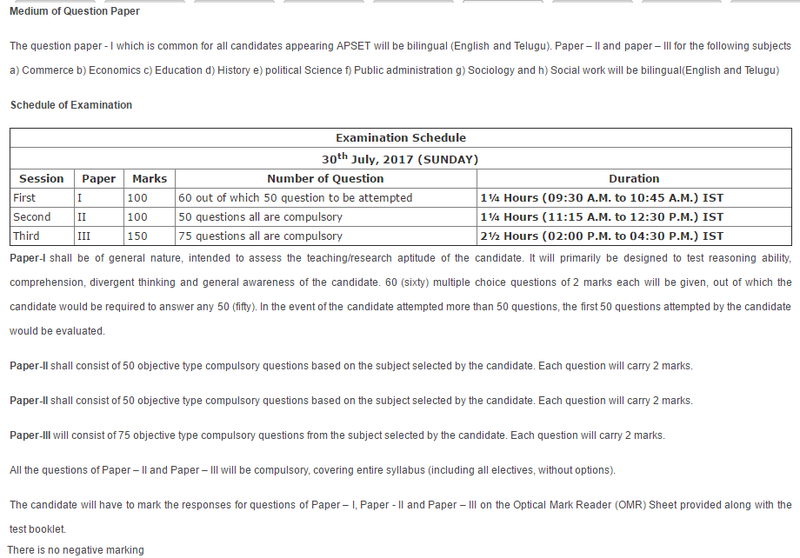 of Question: (Paper-I: Paper-II: Paper-III = 60:50:75 Questions), In Paper-I, Out of 60 only 50 questions have to attempt. Marks Per Question: 02 marks. Candidates will be able to check the list of subjects that are included in the syllabus of AP state eligibility test 2017. Andhra University has invited the candidates satisfying the eligibility norms in all the aspects to register themselves for the AP State Eligibility Test 2017 by submitting the AP SET 2017 Application Form between the dates 30th March to 10th May 2017. After the successful submission of applications, candidates will be invited to appear in the OMR based entrance exam that will be conducted on 30th July 2017 in three different sessions on the same date for Paper-I, Paper-II, and Paper-III. For any type of queries, while applying for APSET Registration Form 2017, candidates are invited to contact us by leaving their issues at the end of the post.